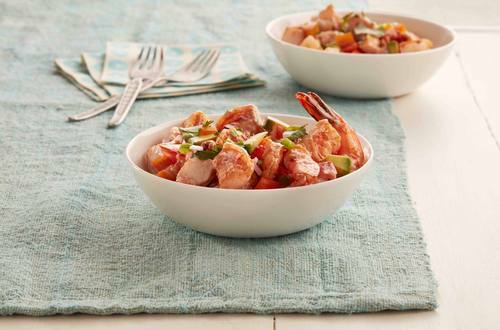 1 Sprinkle shrimp with Knorr® Shrimp Flavor Bouillon. Heat oil in large nonstick skillet over medium-high heat and cook shrimp, stirring occasionally, until shrimp turn pink, about 3 minutes. 2 Coarsely chop shrimp, then place in large bowl. Add remaining ingredients and toss. Cover and chill at least 15 minutes. 3 Serve, if desired, with diced or sliced avocado and chopped cilantro. TIP: Also delicious served over tostados.